Enveloped, spherical, about 50 nm in diameter. Monopartite, linear, ssRNA(+) genome of about 10 kb. There is an internal ribosome entry site (IRES) at the 5' end that mediates translation initiation. The genome does not appear to encode a capsid (or core) protein. The virions, however, have a nucleocapsid. It is not clear if an additional capsid protein might arise from cleavage of the N-terminus or from an alternative reading frame. 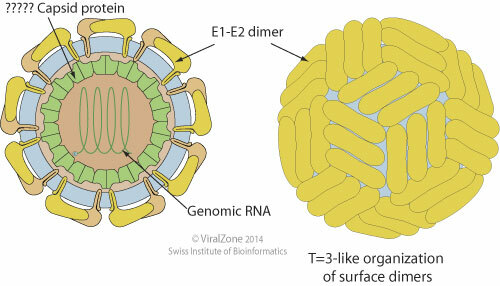 Virus assembly occurs at the endoplasmic reticulum. The virion probably buds at the endoplasmic reticulum, is transported to the Golgi apparatus. ETYMOLOGY Peg: From persistant, and g in historical reference to GB virus and hepatitis G virus names. NATURAL HOSTS GBV-C/HGV: humans and chimpanzees. GBV-A: chimpanzees and several New World primates. ASSOCIATED DISEASES No identified pathogenicity.